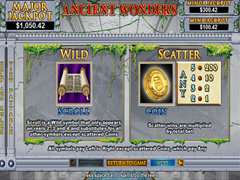 Ancient Wonders Pokie Review - Play Today! 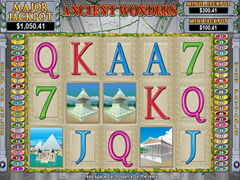 Your screen will fill with outstanding graphical designs when you engage in play on the pokie that brings great wins with ancient wonder. NuWorks created this pokie with a great amount of detail that offers fantastic symbols on 5 reels with 50 paylines. The game also offers a variety of winning boosters that offers scroll wilds, golden coins scatters, free games feature and multipliers. Smooth play makes the game a pleasure to play with outstanding sound announcing every winning spin. The game is also enriched with three progressive jackpots that triggers at random. You will find 50 lines are available in the game, you will have the ability to lower the amount of lines played and to adjust the coin value. Less lines mean less winning opportunities. Coins are available from $0.01 to $5.00. and will allow the game to be played when you wager 1 coin per activated line, this means $0.01 to $250.00 is available per bet. The map to ancient wonders is unfold in the backdrop to lead players’ focus directly to the neatly displayed reels framed with green leaves. Animated symbols offers eye pleasing displays with the great golden pyramids, lighthouse in the ocean with a bright light shining the way for the ships, Grecian temples with pillars at the entrance, unrolled ancient secrets from the scroll, a golden statue in the form of a male, Zeus sitting in a chair statue and a colony of houses on a mountainy island and the poker symbols are tastefully displayed in different colours. Wild symbols can be found with the scroll. The scroll can be found on all the reels to complete combinations by replacing itself for other symbols. The game will award you with no payouts for the scroll as its available on reels 2, 3 and 4 only. Combinations completed by the scroll will offer the same awards found in the pay-table. The gold coin will be featured on all the reels as the scatter. The symbols payouts in multipliers when displayed anywhere. You need no pay-lines for the scattered coin as it will award any. Multiplier rewards are not multiplied by the bet per line, but rather by the combined bet line amount, which is also known as your wager per spin. The game can award up to 200x when no less that 2 are displayed per spin. When 3 of the gold coins are featured the game awards 7 free spins with an increasing multiplier of 1x per spin. Multipliers will start at 1x and can increase to 7x. The game will be able to award an additional 7 free games with another 3 or more scatter symbols. A maximum of 3 re-activation’s can take place during free spins. The scroll symbol will trigger another bonus game when 3 of them are displayed on each of the centre reels. The game then show 7 scrolls of which you can choose 3 of, each scroll can award up to 100x the initiating wager amount. A great game with excitement building sounds when the bonus feature of free games is about to be triggered, wins are also indicated by different sounds. The game offers a huge variety of winning spins with added wins from the great combination of features.